Quick guide on how to easily get 3 skulls in Challenge mode. May include variety of hidden, special and / or generic kills with short videos as examples. Some challenges require precise timing, knowledge of environment and character routes. Full Maps With All Objective / Location Spawns. Full Guide to Virtual Cabin 2.0. Two guys stranded in the middle of nowhere with a broken down vehicle. Very basic challenge with only two targets and couple ways you can dispatch them. Wait till Buggzy goes away to drain the lizzard. Make sure Adam is standing near the hood of the vehicle, then walk up to him from the side or back and execute the kill. Let Buggzy walk to the tree to relieve himself, then walk up to him from behind and execute. You can drop down the car on Adam when he is fixing the back wheel, just make sure Buggzy isn't around to notice. Walk up to Adam when he's under the car and execute the kill. While Adam is fixing the back wheel of the car, Buggzy is on a smoke break a bit down the road. Killing him while he's smoking is one of the bonus objectives. You can use any killing move, easiest is to use the nearby light pole. After Buggzy returns from the wiz, he will go for a smoke break leaving Adam to repair the wheel. After the smoke break, Buggzy will return to the car and if both are alive they will try driving away. Crashing into the car is one of the bonus objectives, however after that one of the counselors will most likely escape on foot. AJ and Mitch are in kitchen preparing food for soon to be dead arriving guests, while discussing their love life when fuze goes out. With no light, AJ sends Mitch on repair mission of his life. Wait till Mitch gets out of the house and walks to the shed with power box. Be sure to follow him inside as soon as he walks in to execute. Timing is crucial as Mitch will back away from the power box, unable to fix it. Walk in through the front door and move towards the kitchen. Enable the Stalk, open the kitchen door, walk up to AJ and execute. Timing is key, sometimes AJ likes to walk away from the stove to drink and yell at Mitch. Also walking through the back door to kitchen will most likely get you spoted. Soon after these two lovebirds are "prepared", our guests Chad and Jenny will arrive. Make sure that they don't meet the owners and instead meet their own end. Chad doesn't have a special kill here, however there's a bonus kill to roast him in the fireplace. He will walk up to the fireplace after Jenny is off to the barn, so hide behind corner and wait for the right moment to grab. Execute at the fireplace. After you dealt with Chad, quickly follow in Jenny's footsteps towards the barn. Stay close to her and as she gets under the well placed hanging rope, execute her. If you waste time after dealing with Mitch, AJ will go to check on him and notice the body. Make sure you don't stick near the main entrance as Chad and Jenny walk inside, sometimes you get spotted being outside the porch. Chad is the only "non-special" kill here, but is part of the challenge bonus. A dark house in middle of camping grounds with two counselors inside. AJ is having doubts that all the events taking place is just a coincidents. Kenny is trying to calm her down, reassuring that there's nothing to worry about, and blames all on the pot smoker Chad who's hanging around somewhere at the camp grounds. This is one of the ways you can end the challenge, killing two counselors with one Chad.. well kind of. All you have to do is wait till AJ and Kenny meet up in house after Kenny repairs the power box. As soon as both of them leave and start running away, follow them to the point where they meet Chad, who's in his all time highest of the highs and execute. You can kill Kenny while he's repairing the power box, by drenching him in gasoline and setting on fire. Just follow him after he leaves AJ, he will run straight to the house with power box. Take note that AJ will eventually go and check on Kenny if he's dead. It's a kill that you can do near a road sign located near where Chad is hanging. I haven't tested it but I'm pretty sure that you can't do it safely on AJ if you roasted Kenny. As she will find his body and run away towards said sign but you won't get the "Undetected" skull, nor is it rewarding point wise if you deal with Kenny otherwise. If you do try to get it, make sure you follow the person closely and grab them as they run past the sign, onto the main tarmac road. If you're doing the single execution, make sure you stay close to AJ and Kenny as they run up the hill to hanging Chad. They both will stop under Chad to watch in terror on their friend, and after split second continue on running. So you have to catch the moment. A perfect setting for a duo date on a lovely summers evening. Boys being boys, trying to impress the ladies by playing with the basketballs. AJ wants a different kind of action and takes Kenny upstairs leaving Tiffany and Shelly downstairs. Smooth Casanova Shelly quickly goes to second base trying to seduce Tiffany, which fails completely resulting in her leaving him alone. As AJ doesn't have a special kill here, I just went with the generic kill in bathroom. Wait till Kenny and AJ make out on second floor. After Kenny says he will go grab a beer, quickly get inside and hide as Kenny will go down the spiral ladder to kitchen. When coast is clear, go upstairs and execute AJ. I used toilet, feel free to do her differently, just don't throw her out of the window or first floor. If you haven't turned on the shredder outside, Kenny will return upstairs to AJ and find her if she's dead. First thing you do before you start anything is Morph near the shredder which is behind the main house and activate it. That will set in motion the trigger for Kenny to check it out after he goes for the brewskie. I dealt with Kenny after freshing up AJ in bathroom, just make sure he walks up to the shredder and execute. Wait till Tiffany is relaxing alone on the pier after she's been pranked by Shelly. She will go wondering around after that so make sure you execute her as soon as Shelly is away. Interact with the well placed harpoon gun, next to the small shack at the pier. After Shelly gets rejected at the pier, he aimlessly walks off to the nearby barn. Jason must help the poor bloke with his love struggles and relieve his groin tensions. Just wait for Shelly to walk into the barn and stop near the scythe, carefully placed by our good friend the Reaper. All the special kills require good timing, some of them can't be executed after some time so be careful. Tiffany sits on pier, then walks a small circle around the camp grounds and after returns back to pier. AJ mostly moves around the second floor bedroom and bathroom. Kenny goes for a beer downstairs once in a while and then goes back to have fun with AJ. The only counselor that doesn't move (after he's visited barn) is Shelly, he returns and sits at the porch. Calm evening at the Packanack Lodge that will slowly turn into a night to remember, or not in their case. Tiffany feels like taking a dip in the lake, so she walks off swimming and soon after Chad goes to spy on her wild curves. Meanwhile Buggzy is recovering after an accident leaving him in wheelchair. Adam offers Buggzy an arm wrestling challenge, which he accepts as both of them feel like boasting in front of the ladies. I chose a generic kill on the tree stomp for Chad, as he's peeping at Tiffany in the lake. It's close and quick to execute just wait till he gets near the spot. You can also execute him on the rock on opposite side of the beach as he tends to cycle from spot to spot as he's peeping. You can try to use any other kill instead of this one, as there's no Chad specific one. However there is a bonus to kill someone in a fireplace. This one is pretty simple, a bonus kill to drown Tiffany. Just wait till Chad is out of the way, or he will see the floating body. After Adam "wins" the arm wrestling, AJ will call him upstairs for some "exercise" leaving Buggzy and Deborah flirting by the fire. Wait till Adam and AJ are both in the far right room on the second floor, then Shift unnoticed upstairs and wait for the dialogue to end and moaning to begin. Then simply open the door and walk in. The killing scene will trigger itself. Same as Chad, Deborah doesn't really have a special kill, however she has a bonus kill to be executed while she's preping her up at her house. Jason went for the door kill as he's well renown hair stylist, by executing his fabulous hair between door and frame press. Wait till Buggzy is on the far side of the porch near the ladder before executing him with nearby machete. Buggzy tends to roll around the house and porch, making a circle so shouldn't be too hard to do this kill, if he's the only survivor. Haven't tested but my guess is Adam and AJ don't leave the bedroom unless you are spotted. Might be the same with Tiffany and Chad. Deborah leaves the Lodge to freshen up and then returns to Buggzy. If I'm wrong let me know. What can be better than bunch of friends enjoying some quality time while camping in the forest, late at night telling scary stories. This is one such night and Jason was prepared to meet them and share a tale or two. First thing you do is get in the water and move to the small ramp with a motorboat. Walk up to the back side of it and turn on the engine, that should peek Eric's curiosity when he walks near it. When he's next to the engine, walk close and execute. 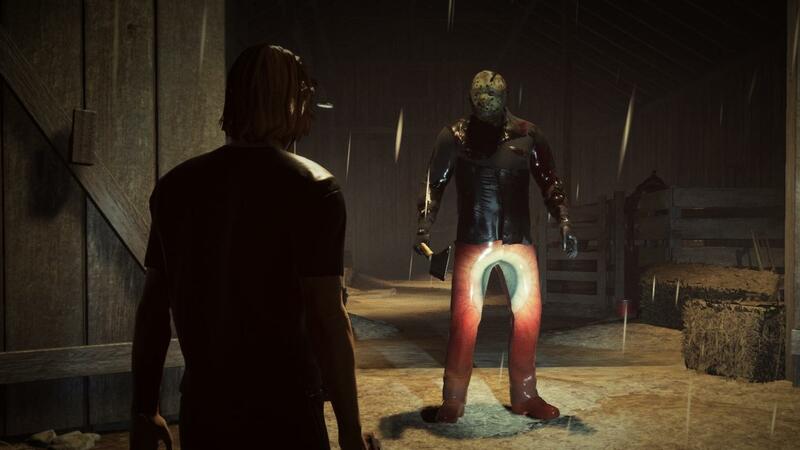 This is a bonus kill that you can do with any Jason that wields axe. I picked Kenny as he often goes to chop some wood, late at night with all the girls taken, oh poor guy. Don't worry you have been chosen by Jason Care, because Jason cares! When you grab Kenny, move him closer to the wood pile and trigger any kill you have equipped for bonus kill. AJ has no special kills on this level, so I picked a generic kill resulting in many stars as her head gets gently slammed agains't the bridge railing. A special kill with Chad, easily executed if you walk up on him from behind in Stalk mode. Jason just didn't have any marshmallows, so he used Chad instead. Tiffany invites Adam for some quality time in the tent, lets make sure those two stick around in there for good. It's simple, all you need is two mildly drunk counselors, a tent, some lingerie, well placed spear or long steel rod and Jason. Check. Execute! Make sure to stay out of Kenny's vision as he walks down to the wood pile, as he will spot the dead Eric and other way around too, Eric will see dead Kenny when he will walk by. AJ is often switching sides while on the bridge and will spot you unless you Stalk or Shift to her. Tiffany and Adam tend to stay in tent. Kenny will move between campfire and wood pile. Chad will sit at the campfire after coming back from AJ. After some time AJ will also return back to the camp from the bridge. Eric tends to walk around the island with his fishing rod. Stormy night at the local camping grounds, and things are slowly starting to heat up. In one of the houses a game of strip poker takes place and in the house next door a couple is making out. Smell of beer, sausage and naughty thoughts are filling the camping grounds so Jason goes out to investigate. Buggzy feeling like grabbing a beer and so does Vanessa, so being a gentleman he runs off to get some. He storms out in the rain after the beer, which is located in different house (because it wouldn't be right to play cards at the house the fridge is at). All you need to do is for Buggzy to go out the front door, then meet him at his destination with unnecessary amount of stab wounds. Follow Buggzy to kitchen and wait till he stands by the counter, walk up and execute. Chad is really nasty and AJ knows it, yet she date him anyway. Jason will help! All you need to do is grab Chad while he's dancing and try to slam some sense into his skull using the nearby door. Chad doesn't have any special kills on this level, as far as I know. After making out with Chad, AJ will go freshen up to the community bathrooms that are located quite a bit away from the house they are in. Guess Chad was so nasty she needs a wash. Anyways, just follow her to the bathrooms, or Morph there if she's inside, then either execute her while she's next to the mirror or grab and take her there, smashing her face into it. After Buggzy has been away for some time, Kenny, like a good samaritan will go check on his bro and his beer issue. He will use the back door of the house where you dealt with Buggzy, so plan ahead on where you will grab him as you need to execute him on the fridge door. With body in kitchen, Kenny will spot it as soon as he turns to face the doorway, grab him right before it and move for quick execute agains't the fridge. Vanessa doesn't have a special kill on this level, so I picked the toilet flush to help her cool down, as she tends to go to bathroom in the poker house quite often. You can use any other nearby spot to deal with her, just make sure nobody sees her. It's a special kill with Deborah, it triggers when you come close to her house, where she goes after the poker game to check on her precious books. As you walk up to the house, you will hear a scream in the distance making Deborah go investigate, just stay out of her path and follow to the nearby shooting range. When she runs off to the middle of targets Shift to the barrel with bow on it and execute the bow kill. Who knew Jason was an archery expert! When Buggzy goes for the beer, make sure he takes front door to exit, otherwise he will take too long to reach the other house, and break all the timing for other kills in this chain. Deborah will leave shortly after Buggzy, so make sure you kill Chad next to the far door like in the video, otherwise sometimes she can spot him in the house as she walks by to her own house. After AJ freshes up at bathroom, she will return to Chad, both of them will dance and you won't be able to safely execute them without one seeing you. Vanessa tends to just stay in poker house, moving from table to bathroom. Deborah stays in her own house unless you walk up to it, triggering her to run to archery range. Chad will check on AJ if she's dead, after dancing for a bit. Three counselors are trying their best to find out what's going on, but with phone dead and heavy rain storming outside they don't have other choice than to investigate other nearby houses for other people and means of escaping. Kenny and Jenny leave poor Chad alone and run to the nearby house to investigate. This is really simple, yet special kill with Kenny. Go to the nearby house with open basement door and wait for Kenny to walk down the stairs. Let him move a bit towards the counters and walk up to execute. Jenny doesn't have a special kill here so just pick the one you like, without getting her body spotted. I picked the generic toilet flush yet again as she tends to explore the house and goes up the secluded bathroom upstairs. Follow and grab her right as she walks into the bathroom, then flush her in toilet. After you kill Kenny and Jenny, Chad will run out of the house he was left in and investigate what happened to his friends. There's a special kill near the wheelbarrow next to the house that you kill Kenny in. And when Chad runs to investigate you can grab him and move to the wheelbarrow for the kill. Requires good timing as it's not very close to the pathing that Chad will take but it's doable. There's a bonus kill you can do with Chad when he's hiding in closet on second floor, however it's only a bonus kill with generic animation thus not as rewarding. If you pick to kill Chad in hiding spot, you tend to miss the window on Kenny's special kill so it's not worth it, unless you do all bonus challenges. In order to make Chad hide in the closet, you have to walk inside the house he's in without Stalk, eventually he will get scared and run upstairs, then just go to the closet and execute. Jenny will run to the basement to meet Kenny after she finds something disturbing upstairs, afterwards both of them run to nearest escape unless Kenny is dead, then Jenny will run for her life alone. Heavy rain is pooring over the local farmhouse. It's late evening but people are still up, Eric and Vanessa watching action movie, Buggzy sleeping, AJ dancing in her room. Out of the darkness you notice a silhouette running through the rain, it's Deborah! There is clearly something wrong, and Jason is about to find out exactly what! Right as the game starts, Morph to the orchards and follow Deborah running through, if you stay close to her she will stop to take a breath right next to the pole, execute for a special kill. Eric will walk out of the farmhouse for a little stroll (in the heavy rain.. alright), make sure you follow him as he slowly will walk to the nearby barn with a grass cutter nearby. Like any clueless gamers he will be curious of the contraption, all you need to do is walk up and execute. Buggzy doesn't have special kills here so pick one that you wish. I picked the generic head slam over the counter as it's right at the place he's in and no one will see the body. I know it looks really unoriginal with so many toilet flush kills, but they always walk in the bathroom. Also I can't recall if Vanessa has special kills here, let me know if I missed one for her. Just make sure the body stays in bathroom, so it's not spotted. Special kill for AJ, walk into her room with Stalk on and get close to her to execute kill. It's pretty simple yet weird looking, I have no clue what is even in the shots, my guess is as good or as bad as yours! You can kill Deborah with a road sign as she runs past one, right as she leaves the orchard. It's hard to time correctly but sometimes she will stop right next to it. All you have to do is grab her and execute near the sign. Deborah always runs straight to the farmhouse alerting everyone in there so killing her before she reaches the house is a good idea. Sometimes she will run past the "scarecrow" pole without stopping. Buggzy sometimes walks around the house, going to kitchen on first floor and back to his room on second floor. Buggzy tends to spot you if you get too close to bed and runs away, so try to use Stalk. Vanessa always moves between her room and bathroom, be careful when you walk up the stairs to not get spotted. AJ stays in her room dancing. Final challenge at the Jarvis residence. It's a full blown party, with loud music, movies, dancing and some making out. Also this time around we have Tiffany's twin sister visiting, who is a lot better at drinking than the "original". Vanessa doesn't feel like being there so she goes for a dip in the lake, soon after followed by her boyfriend Kenny. Eric and Chad argue which one of them is a better man that deserves Tiffany. Adam and Deborah enjoying the movie before moving for some private time to the second floor. Jason will have his hands full! A few minutes into the game, Tiffany's twin sister will go home. And by home I mean she will leave the map, so she's the first target you need to deal with. I picked a generic toss through window kill, located well off from the main building, so no one will spot her. It's a bonus kill to deal with her as she's walking away. As Vanessa leaves the party to cool off because Kenny is being... well a girl magnet at the party, Kenny turns down Tiffany's offer to make out and walks off to check on Vanessa instead. He doesn't have a special kill, as far as I can recall so I dealt with him at the pier, right in front of where Vanessa is swimming. Well placed screwdriver and he's flat on his back. Pretty simple kill, just get in water next to the Vanessa in her yellow, rubber boat and execute the stabby, stabby. After having some fun with Tiffany (who could have thought), Eric goes to kitchen to get some corkscrew for wine (I guess Tiffany is into wine) that he can't find. As the proper gentleman and man with good tastes, Sir Jason must help the fellow succeed in the courtship! Just wait at the back door of the house (open it beforehand) for Eric to walk into the kitchen. As soon as you hear him say "where is thine corkscrewiness" it's your queue to walk in and execute. I'm getting a bit lazy with kill names. Chad is watching movie about Tiffany dancing (I wonder why), just walk up behind him using Stalk and execute the kill, just make sure no one's around. As she doesn't have a special kill, once again I'm using my trusty toilet flush. After having some fun with Adam, she usually walks to the bathroom on second floor, that's a neat place to deal with her. Tiffany is in the room to the right of the hexagon window, a perfect place for her first.. and last flight lesson performed by certified flight instructor Jason, with over 100000 registered hours of counselors flying through windows. Enable the Stalk, open the door and grab her, afterwards it's just a simple job of getting her beautiful booty self to said window and execute! 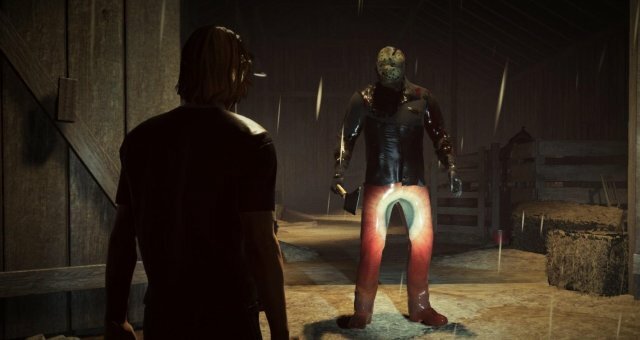 When you have dealt with Deborah, Adam is usually in the room she came out, on the left of the hexagon window, he doesn't have any special kills so same as Tiffany, use Stalk, open door, grab him and kill with any method you choose. I picked door slam. Kenny will spot Vanessa if she's dead in her boat. Vanessa stays in the boat most of the time. Chad just sits and watches the movie. Adam stays in the room on second floor, and Deborah walks back and forth from it to the bathroom. Hard to say what Tiffany and Eric do after they "made out" as I dealt with Eric before he got upstairs, and Tiffany was up there waiting on him.